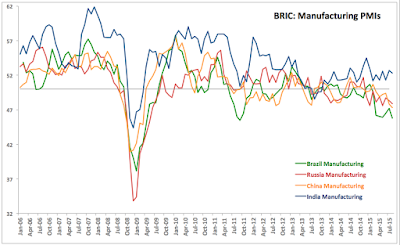 BRICs manufacturing PMIs signalled continued worsening in growth conditions in world's largest emerging markets. Brazil Manufacturing PMI fell to an abysmally low 45.8 in August compared to already poor 47.2 in July. This marks the fastest rate of decline in manufacturing activity in the economy since September 2011 and the 7th consecutive month of sub-50 readings in the index. Russia Manufacturing PMI fell to 47.9 from 48.3 in July, marking 9th consecutive month of sub-50 readings and worst performance in the sector since May 2015. August move effectively demolished previous expectations of stabilisation in Manufacturing sector in Russia. In my previous posts on the subject I have consistently noted that early signs of such stabilisation were yet to be fully confirmed and we will have to wait until we see Services PMI for Russia for more analysis. India Manufacturing PMI continued above-50 trend performance in August, although the index did fall to 52.3 from 52.7 in July. Statistically-speaking, 51.5 for the Indian economy is consistent with moderate growth. Overall, Indian Manufacturing PMIs have now been in continuous expansion territory over 22 consecutive months. China Manufacturing PMI came in at a disappointing 47.3 in August, down on already poor 47.8 in July, marking 6th consecutive month of contraction in the sector. Overall, August reading is the lowest since March 2009. The trend suggests the economy is nowhere neat the target of 7% annual growth rate targeted by the Beijing officials. 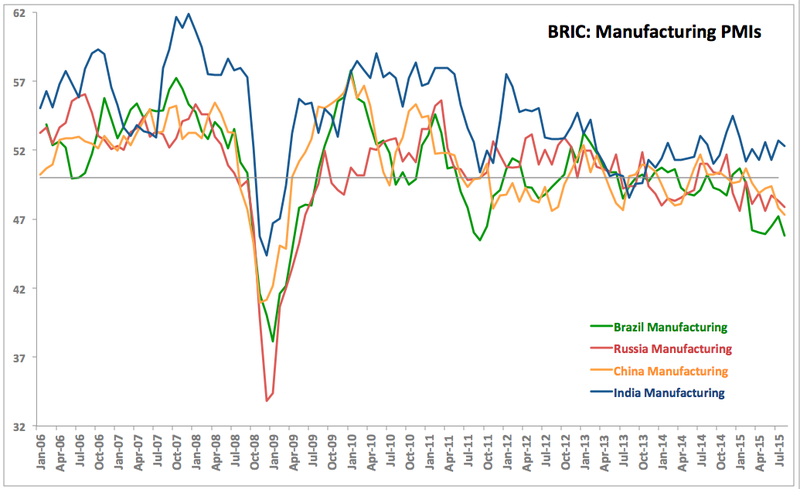 Summary view: Overall, BRIC Manufacturing PMIs signalled deepening of the ongoing economic growth slowdown in the largest emerging economies. We will need to wait for the analysis of Services and Composite PMIs to confirm this, but August has been a disappointing month for the prospects of global growth recovery.